Was there a lawyer in the room when Elon Musk decided to unleash Tesla’s Autopilot to the masses? A decision to put the lives of heedless humans in the hands of a robot. If there were lawyers in the room, what would they say? If they weren’t in the room, why weren’t they? 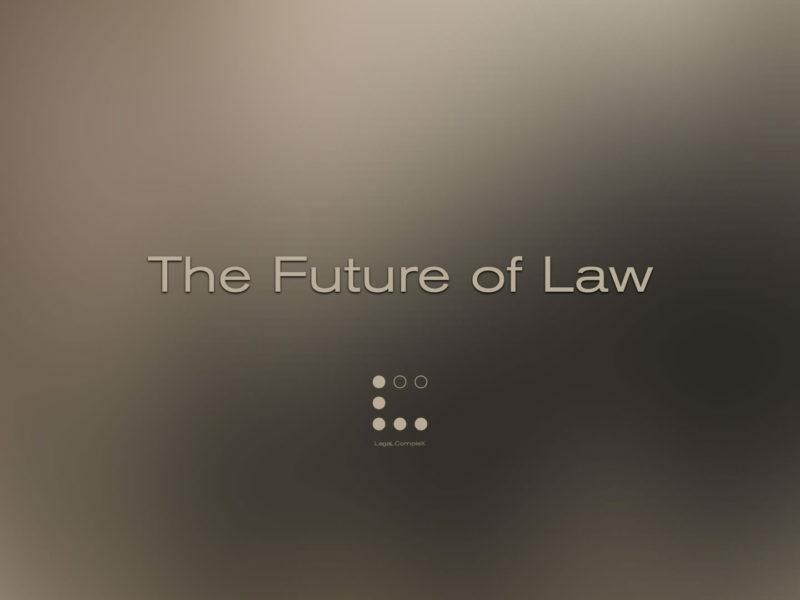 To answer these questions we should understand how the legal industry will unfold in the future. We’ll look at The Market, The Product and it’s Roadmap…and a huge little secret. What is the Legal Industry? It is the business of constructing Trust. Just envision any encounter you have with another person or a business and you needed some kind of assurance, that is where you find legal. Even if you were alone on a deserted island, that island falls under some kind of treaty or agreement to ensure your solitude. When you think that you have enough trust and don’t need any legal in your live, that’s because the legal structure was already solidified somewhere upstream. The end-product for legal is your trust and trust is one of the most precious assets the human race possesses. If you don’t believe me, try living with animals. What is the Market size? Now that you get a sense how ubiquitous legal is, you may be startled to learn the market size is just $700 billion, according to one astute observer. Compared to other industries, it seems a relatively small market and this may be due to what dynamics drive this market. Low volume – High margin e.g. Corporate Litigation & Arbitration, Mergers & Acquisitions, Intellectual Property. 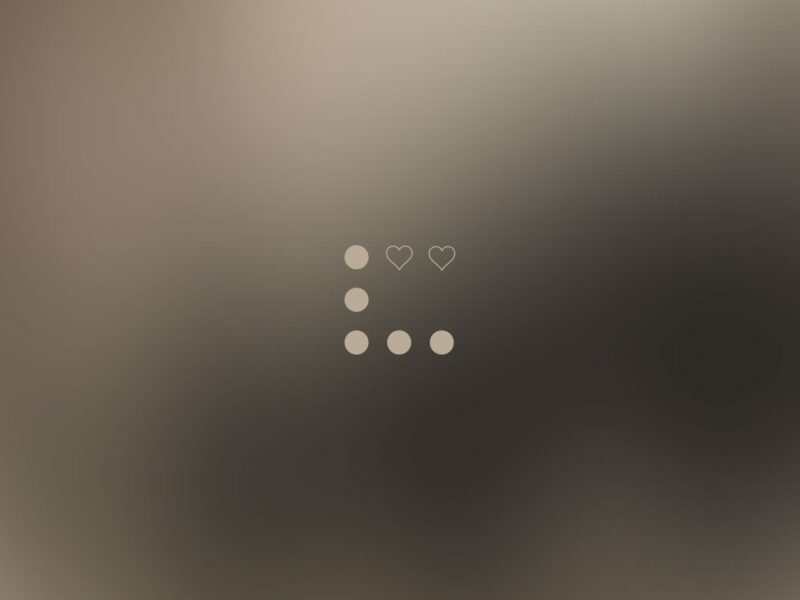 High volume – Low margin e.g. Family & Criminal law, Insolvency, Tax. 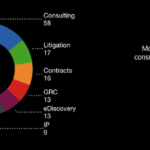 To see an in-depth breakdown of litigation data, check out: The Evolution of Law Charts for samples from The Netherlands. Based on the above dynamics, the supply side of the legal industry naturally flocks towards the #1 segment, leaving many stranded in the access to justice. Apparently, it has gotten so bad that even single-digit millionaires can not afford it. Undoubtedly, we’ve stopped laughing at Peter’s little secrets since November 8th so here’s mine about the legal industry: there is a third market and it’s huge. 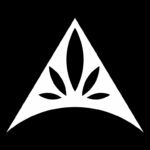 What should the Legal Product become? Trust will become increasingly more depended on Technology. Example: I order a pizza with a smartphone app and want it delivered to me within 30 minutes. Let’s say the merchant offers discounts when the delivery time exceeds 30 min. The app tracks the time, distance and calculates the right price. It can thereby estimate and set the variable amount to be deducted automatically based on these conditions. If demand outstrips supply, the discount may not apply and prices can surge. In return, the consumers can compare offers and seek cheaper alternatives all in the same app in real time. That is the anatomy of a Smart Contract. One can argue that there were mitigating circumstances which caused the delivery to be difficult e.g. earthquakes, scooter crash, terrorist attacks. Well, you add these conditions in the Fine Code to be executed by the app. Now drone delivered pizzas will limit human errors in the logistics but tech can’t remedy all disasters. So we’ll have to include clauses to ensure these apps don’t act like sociopaths. Fact that Uber surge pricing automatically kicked in during a terrorist attack is evidence that the machine can’t handle empathy yet. As this TEDTalk eloquently explains: we can’t outsource our ethics to machines. Our connected smartphone can check for extreme circumstances but we need the Fine Code to hand us a fair deal. In addition, these algorithms will use your social profile, job description, and maybe even your bank balance to determine your optimal purchase power. This is already happening in the marketing and ad space. If we consider all the data which can be used to influence us than biased news feeds will be the least of our problems. AI is alive but our data is the oxygen it needs to deliver us smart services that will improve our lives not send us back to the sixties. Will there be any work left for Legal? Therefore the answer is Yes, it is the greatest opportunity for legal to safeguard our society since the invention of the written law 3000 years ago. We know now that math can’t do it. Sample: a single-digit millionaire is snowed in their secluded chalet, hours away from starvation. Their only option was drone delivered pizzas to reach them in time, what would the optimal offer be? Consider the bank balance and weather conditions in the calculation. So how would that work? In all Transactions lies a legal agreement in disguise: the assurance of fairness. Now, every transaction happens within a chain of several Interactions. Each interaction has its own set of rules and is govern by law. 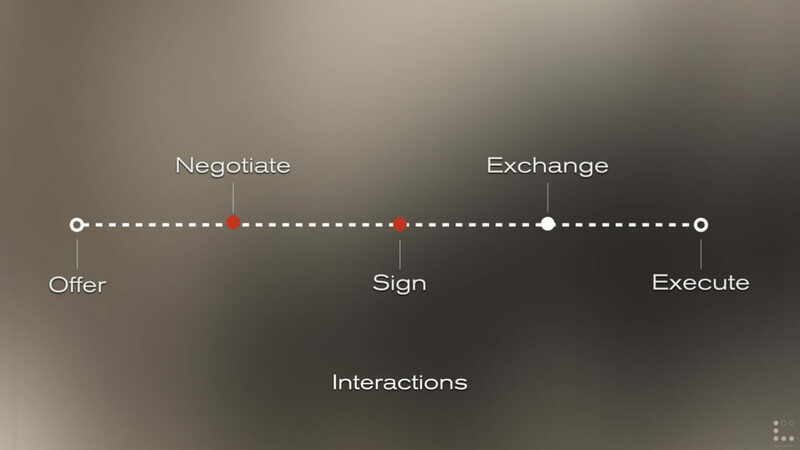 You receive an Offer, Negotiate, Sign, Exchange, and Execute an agreement. One of these pillars of interactions has spawned the first Legal Tech unicorn by helping to seal deals with signatures. Likewise, a similar startup won the 2016 Dutch Legal Tech Award. 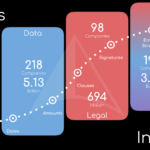 What if all these digital signatures were placed on smart contracts? Why is this Third Market relevant? In a pen & paper world, it was humanly impossible to track all these interactions. Now that we’ve gone digital, they have resurfaced to become an integral agent of new industries and the transformation of our lives. Moreover, going digital meant being able to scale the Volume of transactions as well as the conditions. On November 11th, one merchant made $5 billion in one hour by being able to process 120,000 transactions per second. Each transaction was part of a non-negotiable offer, executed under a single immutable contract and without a signature. It’s inevitable that these exchanges will evolve at both ends: negotiating the deals and settling disputes. Imagine, you could negotiate a discount for a large order of pizzas with just a slider in my app rather than a lengthy complicated phone call with an operator who may be unauthorized to make me any offer. All the while trusting it is a fair offer considering the circumstances and knowing you can resolve any disputes directly in the app. Here’s the kicker, all the ingredients are in place: infrastructure, algorithms, engineers, and demand. No fancy blockchain required unless we aim for near-perfect transparency. The minor missing piece is the Consensus. Why minor? Let’s go back to the first statement about Tesla’s Autopilot. I bet there were engineers in the room and maybe even some marketing people to get consensus. If they would have invited a lawyer, it may have never launched. What is the Roadmap? In 2013 I drew an image depicting the path I envision the legal profession would travel into the future. 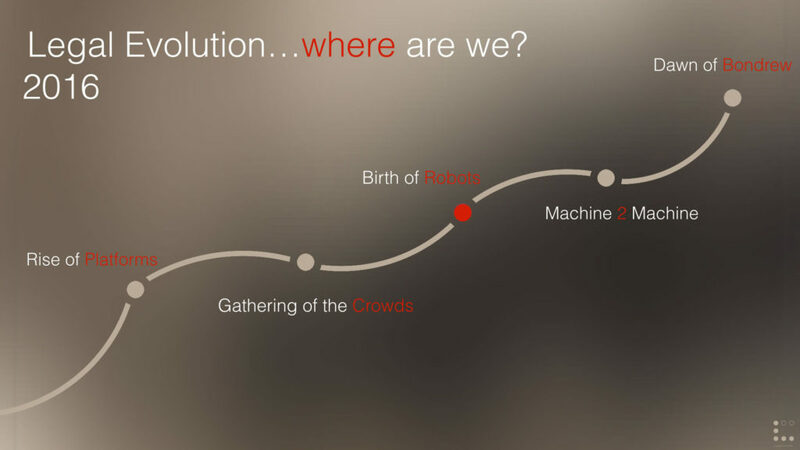 First, some see change coming and build the technology and platforms. That movement gathers steam and attracts passionate crowds to rally behind these platforms. With more minds on the job, we get to build robots. Robots which in turn would start to communicate and assemble themselves. This will free up the minds to return to the boardroom and ponder the safety and fairness for future generations. Here’s some evidence we are on this trajectory: in the year 2014 and especially 2015 we saw a rise of legal tech startups vs just legal startups. 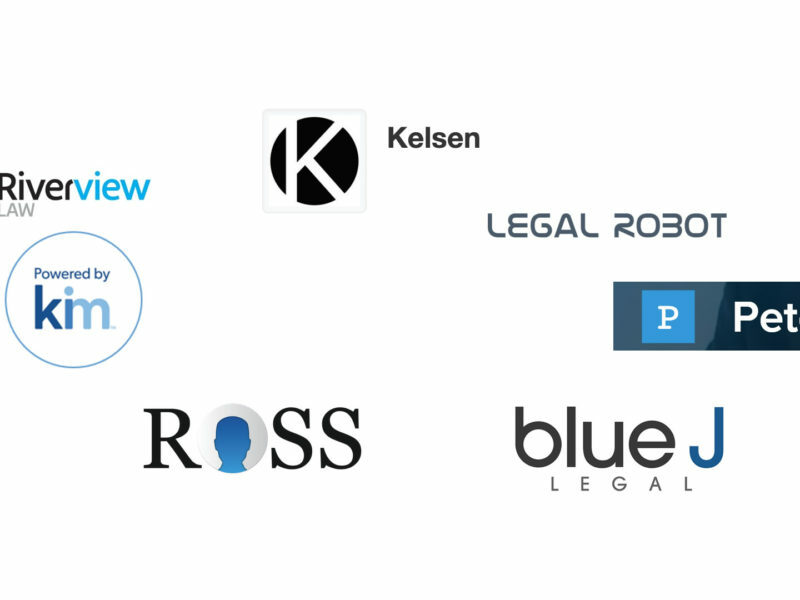 For every 10 “law firm” startups created, we had 3 Legal Tech startups (3:10 ratio) in 2014. In 2015 we ran at an amazing 7:10 ratio clip. This year we dropped to a 5:10 ratio. Check out the chart: Legal vs Tech 2016. In 2015-2016 we also witness the rise of Legal Hackers events, Legal Tech Meetups, Awards and Conferences. Dedicated Legal Tech incubators, accelerators, funds and institutes. Legal now has it’s very own AI award and Design Summit. There are many communities and networks to choose from so I encourage you to join one. This year, we also met quite a few robots. Lawbots generally answer simple legal questions or generate documents. The next natural progression of legal AI is that machine generates law and create smart contracts. If a robot can navigate traffic than regulating humans isn’t far fetched. Who will Build this stuff? In the 80’s the financial experts ruled the world. If you could calculate you would be at the top. That slowly transitioned to the engineers in the 3 decades thereafter. Those who could compute went on to become rulers of the platforms. But remember that they all started in cubicles on spreadsheets and terminals writing formulas and code to lay the groundwork for the future. Now I see the beginnings of a new shift, those who can Consensualize* and restore the balance within the code will become the Players in the future. Who are the Players? A few words on who will pioneer this revolution. We have the Investors, Builders & Consumers. Investors aren’t only the ones handing out angel capital, these are also students, engineers, and enthusiast who see the need and are willing to invest their expertise and time for a career in legal. While I do see the passion from the existing legal professionals, I’ve yet to witness the new mindset it requires. I’ve noticed that successful Builders of legal tech generally aren’t legal professionals but rather practically minded pioneers that see a problem and want to fix it. Why these Builders succeed is that the new Consumers of legal value the products for their simplicity and practicality not for its complexity nor completeness. Any business needs trust to operate and serve customers. Where you need trust, your hire legal. The message for legal: your end-product can not be just talk & texts, it has to be technology. One can hardwire trust into a chip like Apple or convert the entire language of lawyers into a computational one like Stephen Wolfram’s Symbolic Discourse Language. In any case, it will reside in the code not the courts. The legal elites may have to stop chasing the high margins in low volumes because the people just want pizza to be great again. So to get back in the boardroom we’ll have to start at the bottom and involve everyone with a passion for serving fairness. If legal wants to help the next Elon Musk launch the next AI, legal should draw the blueprint, not draft the fine print. If you don’t believe me, try living with AI. Software is eating the world, #LegalTech should be hot sauce. Consensualize* : the act of continuously calibrating connections between commerce interactions to balance these interactions for fairness. Is used in algorithms to proof their legitimacy by having them constantly be validated by an external independent framework of rules on justification. Is derived from the word ‘Consensus’.